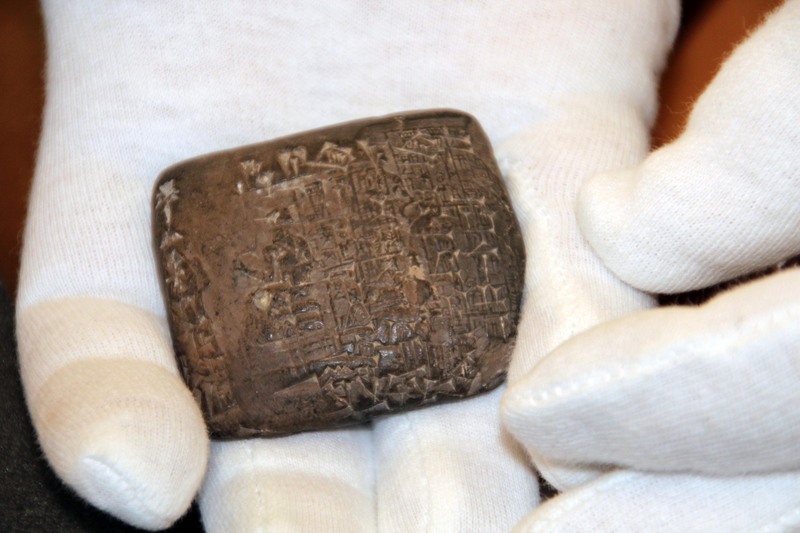 It’s shaping up to be quite the year for Department of Visual Arts professor Sandra Meigs. Hot on the heels of being named one of eight recipients of the Governor General’s Awards for Visual and Media Arts in March 2015—an honour that saw her work featured in a special curated exhibit at the National Gallery of Canada this past summer—she has also just closed All to All, her most recent solo exhibit of new work, at Toronto’s acclaimed Susan Hobbs Gallery. And now, Sandra Meigs has been announced as the winner of the $50,000 Gershon Iskowitz Prize at the AGO for 2015. In addition to the cash award, the Gershon Iskowitz Prize comes with a solo show at the Art Gallery of Ontario and a further $10,000 towards a publication on Meigs’ work. 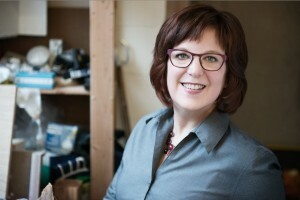 News of Meigs’ prize win was picked up by the Globe and Mail, CBC News, Canadian Art magazine, the Times Colonist and CBC Radio’s All Points West. Meigs—currently on a semester of study leave—joins the celebrated ranks of past Gershon Iskowitz Prize winners like Jack Shadbolt, Gathie Calk, Shary Boyle, Michael Snow and Kim Adams. Sandra Meigs’ work has been described as expressive, eclectic and interdisciplinary; her paintings are known for their unique approach in combining complex narratives with comic elements in large scale works such as The Basement Panoramas and Strange Loop. She is dedicated to painting and refers to the possibilities of enchantment that painting presents through colour and form. For Meigs, the very authenticity of one’s experience offers proof that what is imagined when looking at a painting is as real as anything else that one experiences in the world. 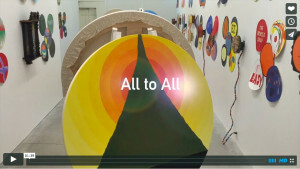 In addition to painting, she has also woven sculpture, film, sound, and other media in her works. The Gershon Iskowitz Foundation joined with the AGO in 2007 to raise awareness of the visual arts in Canada. 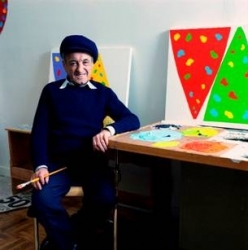 Canadian painter Gershon Iskowitz (1921-1988) recognized the importance of grants to the development of artists and acknowledged that a grant from the Canada Council in 1967 enabled him to formalize his distinctive style. The AGO is home to the artist’s archives, which include early works on paper, sketchbooks and ephemera, and holds 29 paintings by Iskowitz, spanning from 1948 to 1987, in its permanent collection. 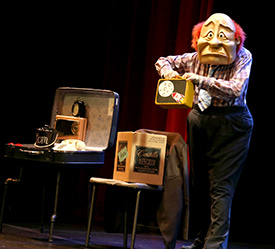 You might think that wearing a mask is a way to hide from others, but Department of Theatre alumna Kate Braidwood discovered while she was studying here at UVic that masks are a fun and engaging way to express herself on stage. 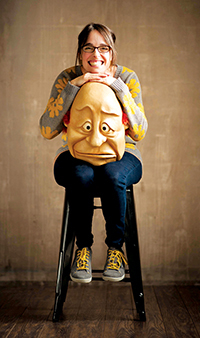 Now, as the co-founder of the multi-award winning WONDERHEADS physical theatre company, Braidwood works with her husband Andrew Phoenix to create playful characters through full-face masks. They then integrate these “wonderheads” into performances fraught with exquisite visual storytelling. LOON, which opened the Phoenix Theatre’s 2015/16 season on October 14, is just one of the acclaimed productions for which this international touring theatre company is known. LOON tells the story of Francis, a lonely janitor with a child-like imagination and a wild fascination with the moon. Unfortunately, Francis hits an emotional rock bottom and he feels like there’s nowhere to go but up . . . and up! It’s a surprising mix of physical theatre, comedy and pathos, all wrapped up in a peculiar, but beautiful, love story. 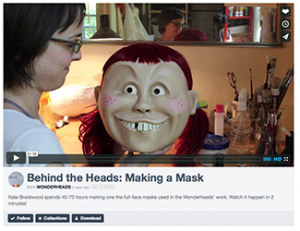 With their creative use of full-face masks, expressive physical movement and inventive lighting and sound cues in place of words, WONDERHEADS’ shows have been compared by CBC Radio to watching “a living cartoon for lovers and dreamers.” (Watch this online trailer.) With “Critics Choice” and “Best Show” awards ranging from Vancouver to Orlando, they have been successfully changing audience’s perspectives on the nature of theatre and storytelling across North America. Braidwood and Phoenix create all of their full-faced, oversized masks from scratch. First they sculpt the head and facial expression out of modeling clay. The head is then covered with liquid rubber to capture expressions into a casting mould, and strips of plaster-soaked cloth are laid around this rubber to construct a hard exterior shell. When it’s dry, the rubber mould is filled with strips of papier-mâché to create the actual mask. The final mask is given eye and air holes, painted lovingly with rosy cheeks, or freckles or whatever is needed for the character, and then topped with a hairdo. LOON runs at 8pm daily to October 24 (except Sunday, Oct 18), plus a 2pm matinee on Sunday, October 24, at Phoenix Theatre. Tickets range from $15 – $45 and can be purchased here. 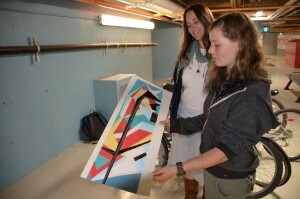 Cycling is much more than a hobby for fourth-year UVic Visual Arts student Kyra McLeod. 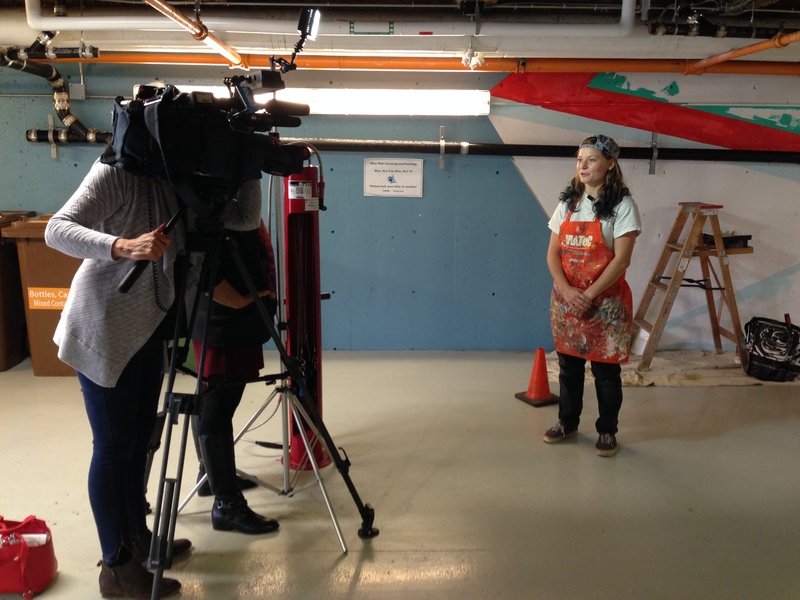 The former Team Canada BMX racer has been commissioned to turn a concrete wall into a cycling-themed public art piece for UVic’s Sustainability Week (running October 13 to 16). “It sounded really unique and totally appealed to me, so I was all for it,“ says McLeod. The 2.5 by 20-metre wall space is part of the Campus Bike Centre in the lower level of University Centre—a reclaimed car parking lot now devoted to bike racks, storage lockers and a bike loan centre. McLeod is designing the mural to reimagine space and objects, incorporating structural elements of the wall—such as pipes and heating radiators—into her artwork. Members of the campus community, the media and the general public have been watching McLeod create the project throughout the week in the Campus Bike Centre, where she feels right at home. 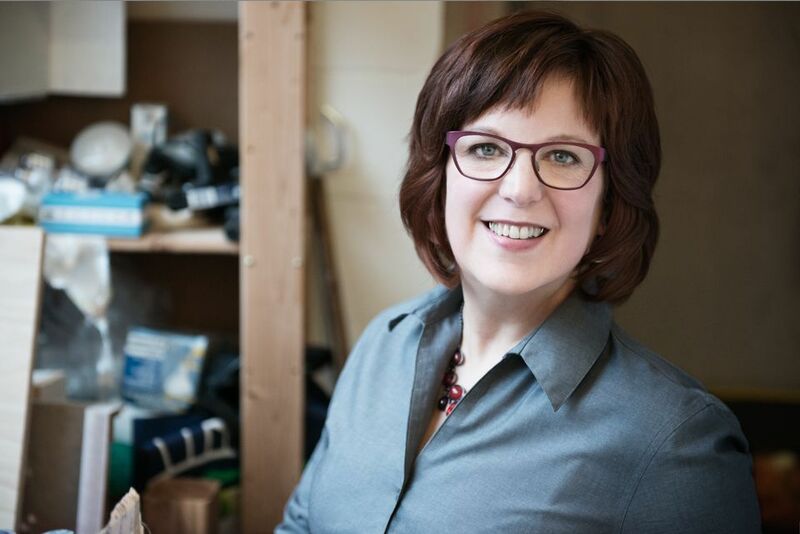 Explaining that she has “pretty much always been on a bike,” McLeod says she started racing when she was eight years old and is now among more than 2,000 UVic students, faculty and staff who cycle to campus. 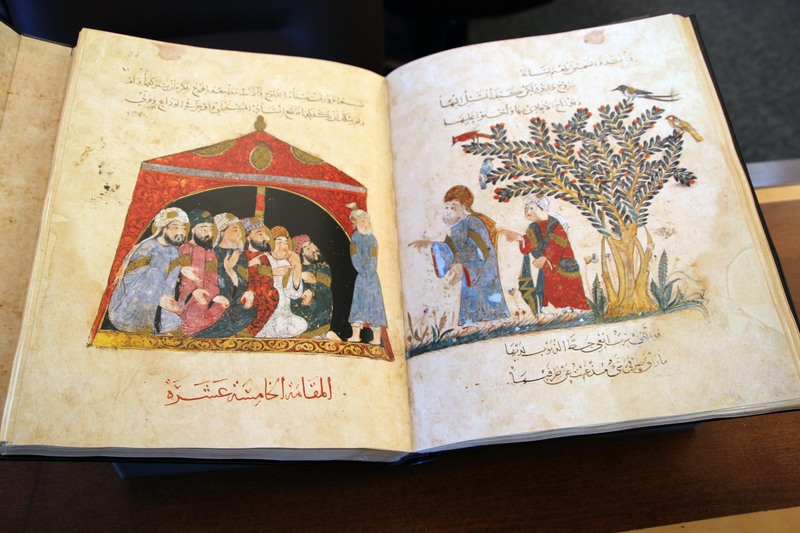 When news broke in August that Syrian archaeologist Khaleed al-Asaad had been killed by ISIS for trying to protect his country’s cultural legacy from destruction and looting, it sent a chill through the heart of Art History and Visual Studies professor Marcus Milwright. An archaeologist and professor of Islamic art and architecture, Milwright has worked extensively in Syria—including the ancient city of Palmyra, the UNESCO World Heritage Site for which Khaleed al-Asaad was the head of antiquities. 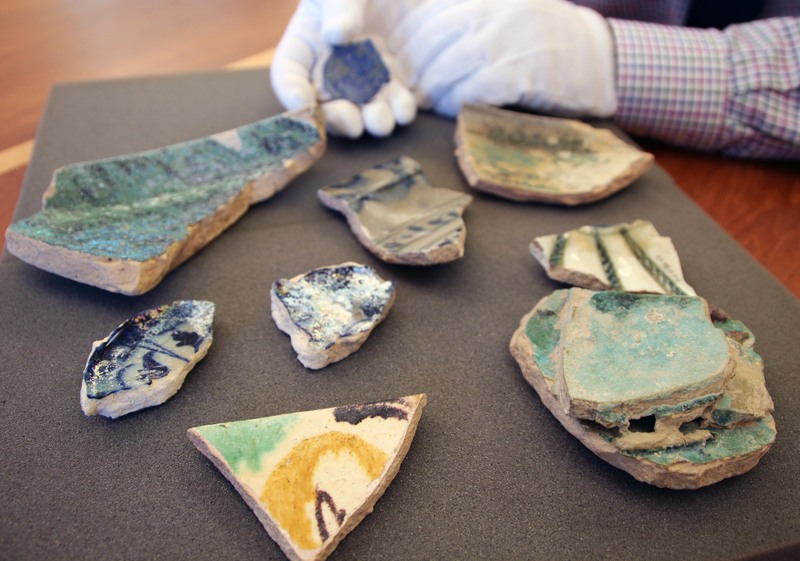 12th-14th century glazed ceramic shards from Syria (Balis and Damascus), most from the collection of Erica Dodd. Cuneiform clay tablet from Iraq, late third millennium BCE, from the Brown Collection. 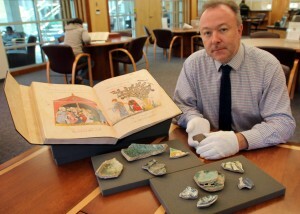 But until it is deemed safe to return to Syria, Milwright is content to work here. 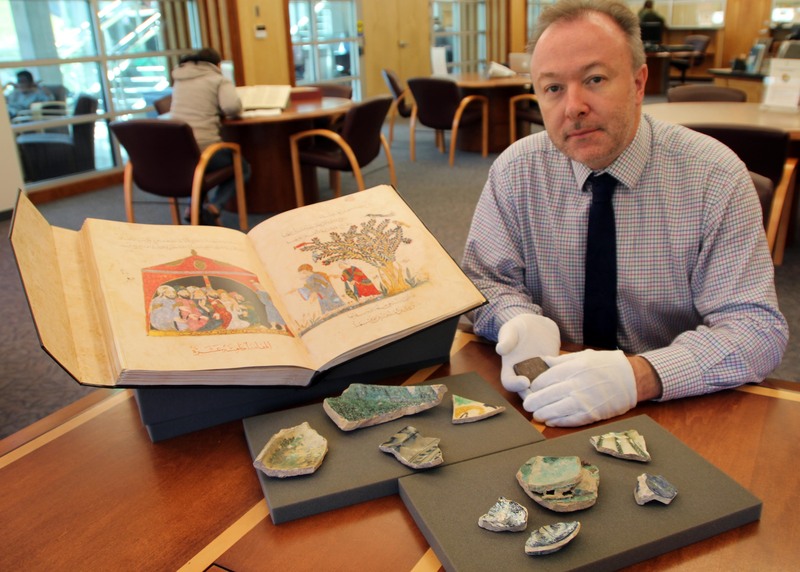 “I am continuing to research the cultural heritage of the country through the publication of archaeological finds from Raqqa and the translation of Arabic texts about crafts in the country,” he says.